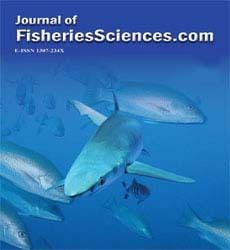 This study was performed to assess exploitation, growth characteristics, reproduction and mortality rates of the Atlantic lizardfish (Synodus saurus Linnaeus, 1758) from the Babadilliman? Bight in Silifke, Mersin, Turkey. For this purpose, 161 individuals S. saurus were obtained by monthly samplings between May 1999 and April 2000, and found that minimum and maximum lengths and weights were 10.7-31 cm and 9.99-267.56g, respectively. Considering growth characteristics, Length-Weight relationship was W =0.0073 * L3.0241, and von Bertalanffy growth constants in length and weight were L∞ =38.04 cm, K =0.153 year-1, to =-1.862 year and W∞ =438.66g, respectively. By using the mean monthly changes in Gonadosomatic Index (GSI) and Fulton's Condition Factor, it was found that spawning season took place between May-June and August-September, and mean annual fecundity were 30070.87±28559.46. It was also estimated that total mortality was Z=0.4037 year-1 and its components were M=0.2519 year-1, F=0.1518 year-1. When exploitation rate was taken into account, it was found that the Atlantic Lizardfish was under exploited (E=0.37 year-1) in the Babadilliman? Bight.